Junkyard boat detour. This new thing we discovered leads to questions. The questions lead to answers, and the answers lead us wanting to buy this boat. Right? Isn’t that simple? I get it. When we think of cool, vintage cars, we think of design victories and groundbreaking, body styles. Well, imagine that cool thing (insert car of your choice), pulling this cool thing! Behold! 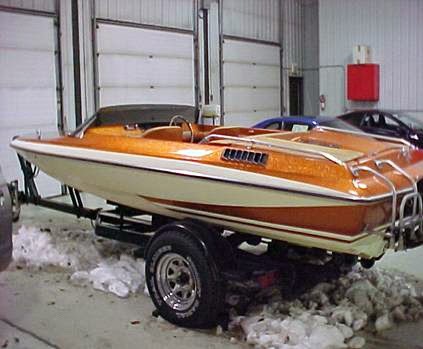 A 1982 Glastron Carlson! These neat-o boats are so cool! We stumbled upon this one, and after a closer examination, found ourselves in love with this glittery refugee of 1970’s styling. So, we began thinking... and that never gets our tribe anywhere logical, and always far from ‘normal.’ The thought began with picturing this boat (above) being pulled behind my 1972 Oldmobile Vista Cruiser. That alone, is enough reason to buy it, right? The original-owner gave us the 50-cent tour of his C512 Glastron boat. During the first ten years-or-so, it was on the water a lot. The lakes, the rivers, and maybe even a trip to the coast. He shared a scrapbook of outings with the boat and the good times it provided. Judging from the pictures, the five-passenger boat was usually filled to capacity. Smiling faces, of the captain and several shapely women, made up the bulk of the photos. This Carlson boat is powered by a Volvo 4 cylinder engine. Our research has uncovered several engine options that changed with the times rather than the hull size or model. Further evidence that this boat was made for us? Dig the trailer! 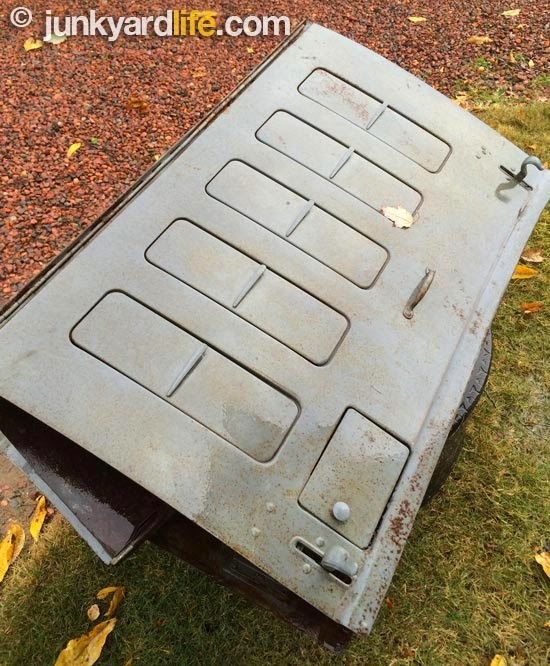 The aluminum slotted mags on the trailer were factory equipment. Be still, our hot rod hearts. Did we have a relative at Carlson? The excessive metal flake paint was perfect for the body. The glittery seats just sealed our fate, even though they need re-working. The formative years for the Carlson Glastron were the same years we here at Junkyard Life adore from automobile industry. Mainly, from 1969 through the early 1980s, where they, like us, apparently found themselves stuck in the 1970s. 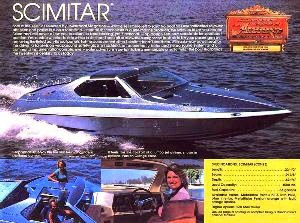 Speaking of 1970’s – these guys also built a model called a Scimitar that had a roof design emulating the very fad and hip T-Tops! This cool boat is as close to a floating Trans Am as I have ever seen. 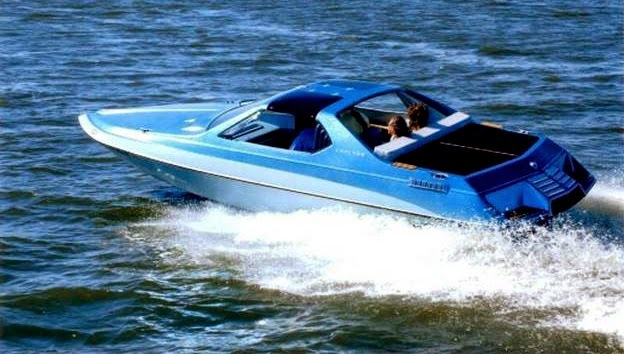 This boat begs to be pulled by a Trans Am – like a black and gold Special Edition or a Nocturn Blue, WS6 or a Silver Anniversary – just to name a random few, for no specific reason. 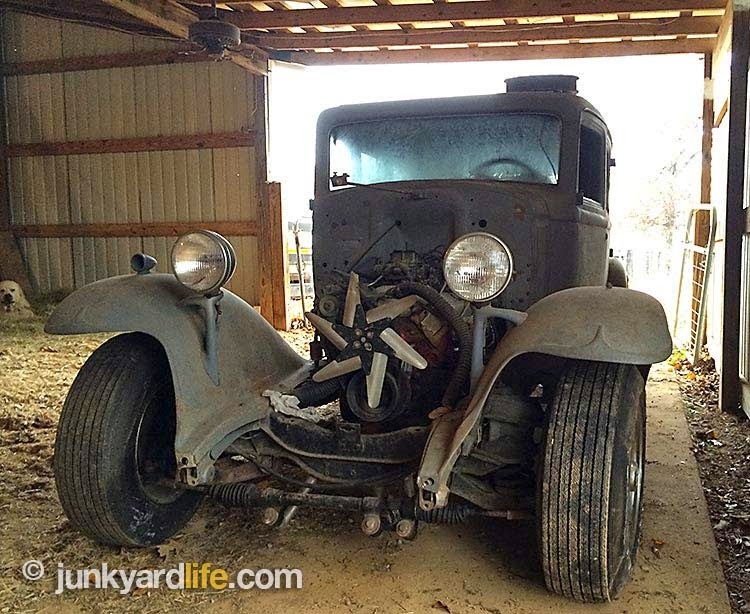 Any resemblance to cars we, at Junkyard Life, may own is pure coincidence. 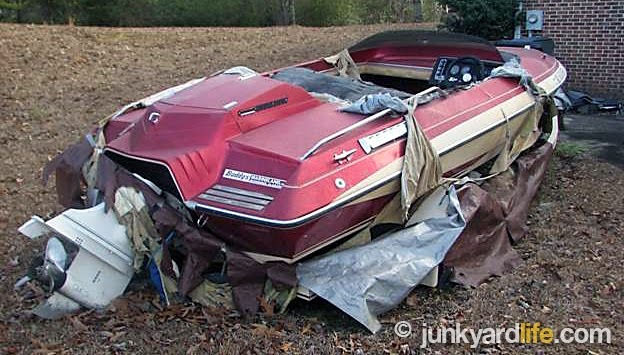 For all we know, there may have been a law in the late 1970’s – if you owned a Trans Am and were in the market for a boat – you had to look at these. It may have been a law that I just made up, but you don’t want us to be law breakers, do you? We really like these boats, now. Remember the famous 1973 James Bond “Live and Let Die” movie and the boat-jumps-everything-scene? That was with a Glastron Carlson! That doesn’t help our logic at all. It is an indication that all safety-minded boaters should stay off the waterways until Ron, Anthony, and Jody figure out that the poor boat cannot actually do this. In green? 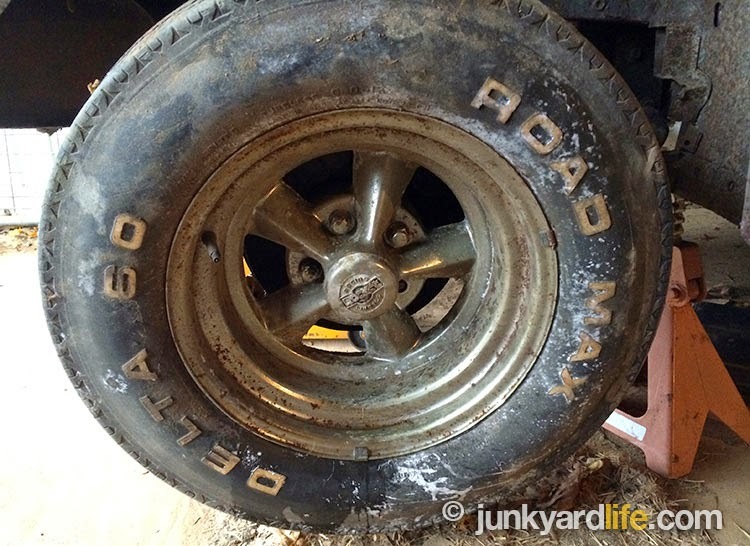 That is so perfect for us Junkyard Life weirdos. This beautiful baby, whose color resembles Sunset Orange Metallic was sold recently. Lucky, new owners, we envy you. 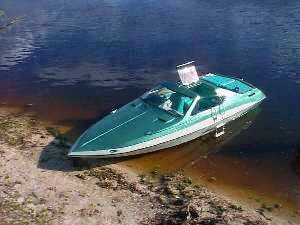 This 1979 Model CVX-18 seats five, runs great and promises a ton of fun. So, now that we are Glastron Carlson crazy, I have a new plan. Rescue one of these (hopefully this one), pull it with something cool and vintage, and hit the water. The history, the design, and lines of these Carlsons are made for us. I must make one more mention of the trailers with aluminum slotted wheels. It was Carlson over-excitement for me. If we got your attention, check them out. I found a lot of friendly forums and a wealth of information from like-minded, vintage boat junkies. 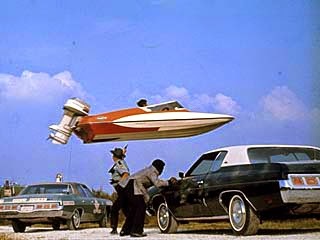 If you walk into the Junkyard Life shop and see 1970’s Pontiacs, and other street machines, then spy a boat in the midst. Before you ask yourself, “which of these is not like the other?” Look again, that boat may fit in perfectly. Ron Kidd loves green on everything with an engine. 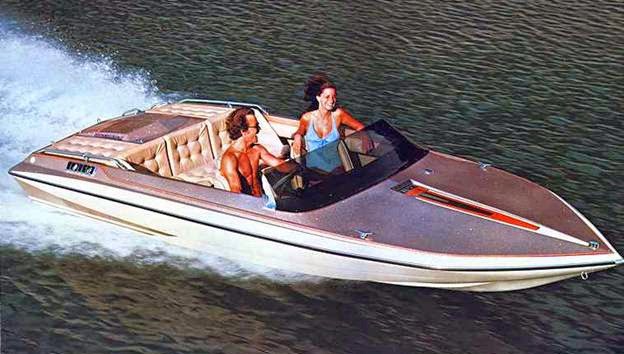 T-top glory in a 1981 Glastron-Carlson Scimitar advertisement. A Trans Am on the water! This concludes the boating portion of Junkyard Life. 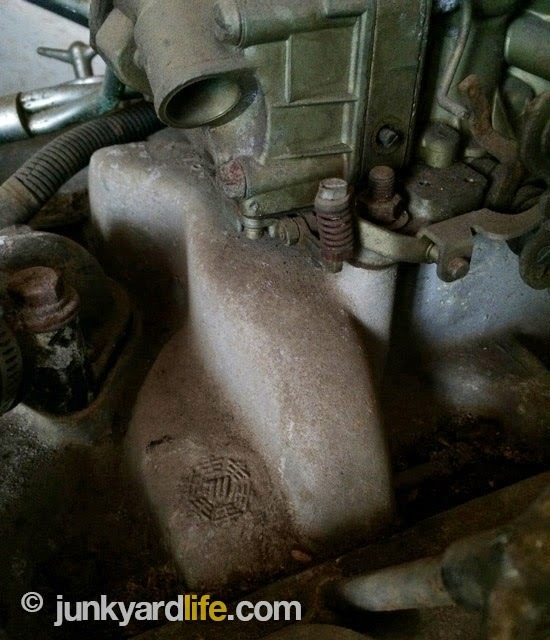 Monster of a barn find. Heard this one before? 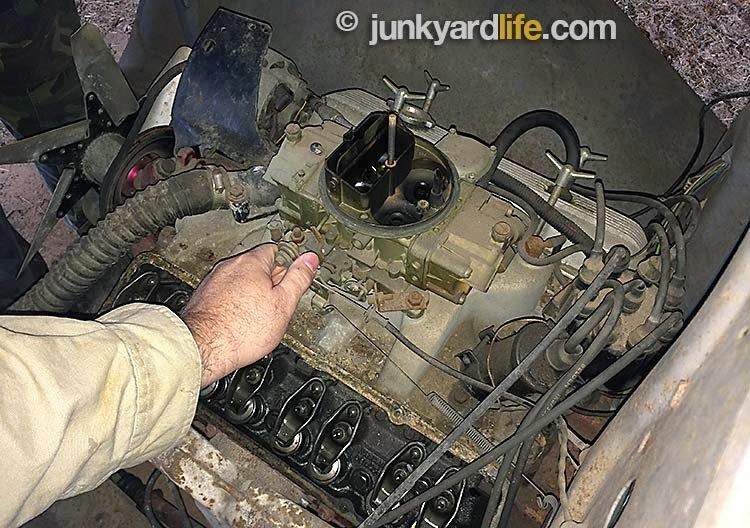 A Ford guy walks into a local, Alabama feed store for his morning cup of coffee and winds up buying a 1969 Camaro DZ 302 engine bolted to a 1932 Buick sedan with a Corvette rear end. It wasn’t that easy, but the facts are simple. 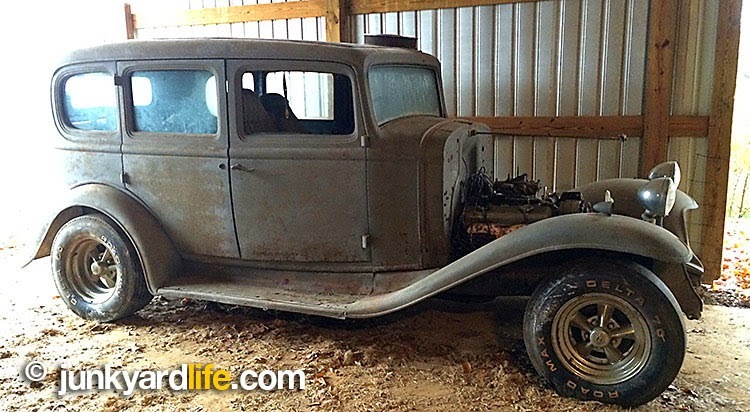 This beefed-up, barn find Buick had been tucked away since 1975. Now, the family wanted it gone. That’s where Jerry Weber got some hot coffee and a lead on this monster in the barn! 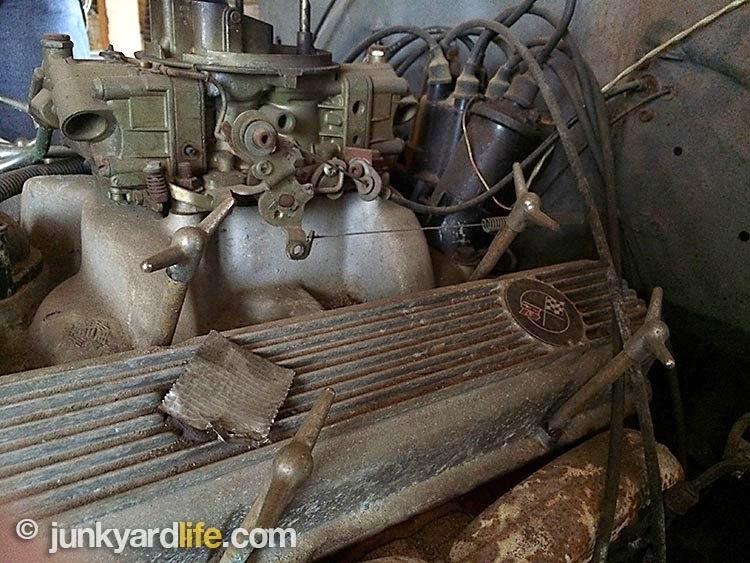 Complete DZ 302 engine sitting between the frame rails of a mothballed 1932 Buick. Holley carb, Winters intake, and finned valve covers all correct ’69 issue. As unbelievable as it sounds, this Franken-Buick received a DZ 302-V8 heart transplant, 43 years ago. 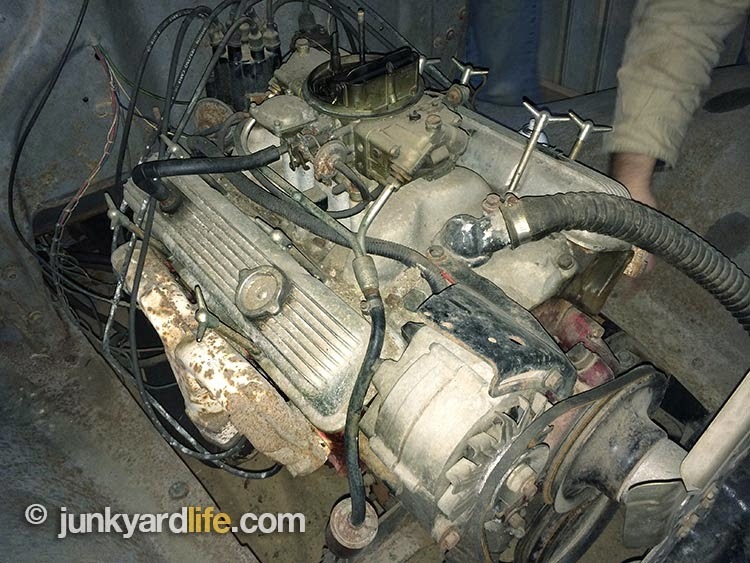 A resourceful, north Georgia, hot rodder scored the engine from a junkyard in 1971. He managed to yank a complete, DZ-stamped engine from a totaled, Daytona Yellow, 1969 Camaro Z28. To complete the 1932 Franken-Buick make-over, he added a Turbo 400 transmission, Rocket brand wheels, and a complete, independent rear end, including disc brakes, out of a 1965 Corvette. Hurst motor/frame mounts were also used. 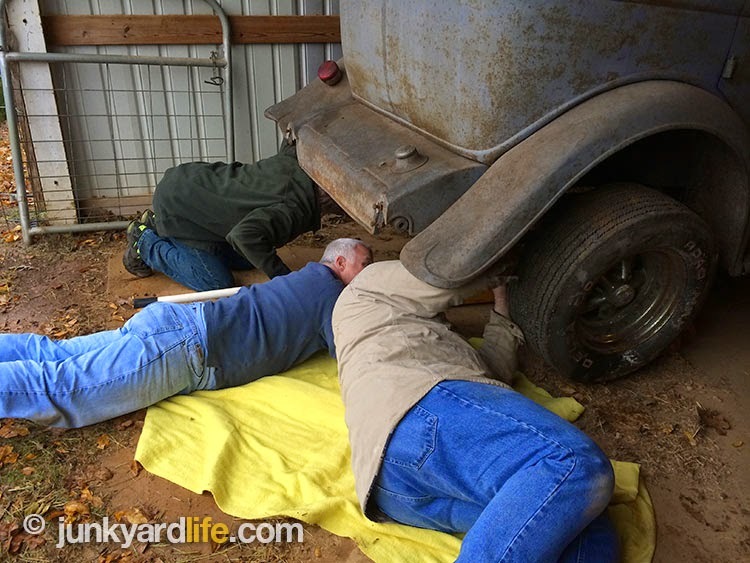 Jody Potter, Ron Kidd, and Keith Lively check out the 1965 Corvette rear end, disc brakes under the 1932 Buick. 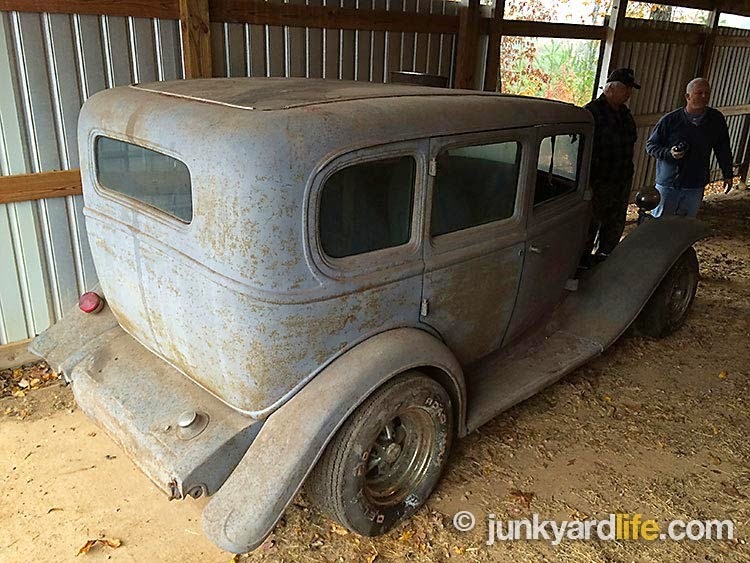 As it turns out, this Georgia, junkyard super hero was building the hot rod for his sons. Somewhere along the way, between 1971 and 1975, he moved his family moved from Georgia to Alabama with the ’32 project in tow. The Buick was road worthy for a couple of years before the sons lost interest and went away to college, around 1975. In the name of hot rodding, or busting knuckles, so to speak, the fan blades hit the radiator. Despite successfully grafting parts onto the Buick, including a Mustang II front end, a destroyed radiator spelled doom. That unfortunate event parked the project for the next 39 years. Blame the flex fan, if you must, but that sacrificial radiator helped preserve a low-mile, original DZ 302 engine. The body on the ’32 is also rust-free. Franken-Buick was hauled to his new home in as-found condition. 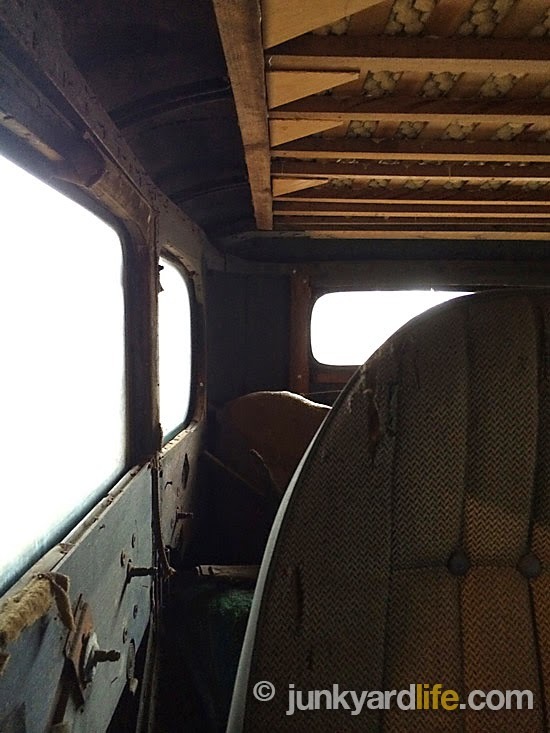 The hood, grill shell, and other parts were removed 39 years ago when the project went on hold. Back to the guy who wanted some coffee. 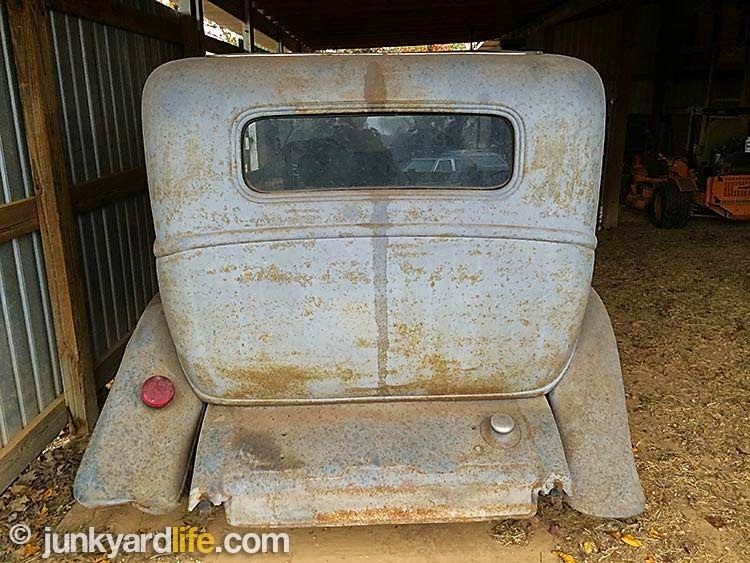 Somehow, things ran off the track when the Ford guy, Jerry Weber, was told a 1940 Ford coupe would soon be for sale. Weber left the feed store, with a phone number, ready to meet the owners and make a deal on the 1940 Ford. 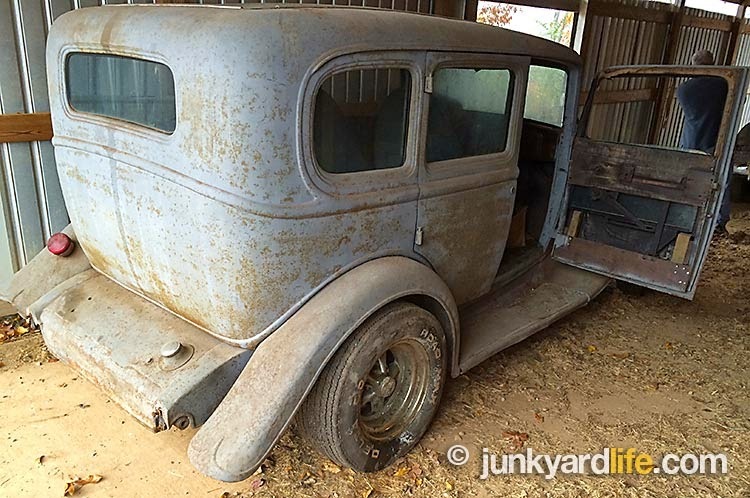 Weber found out that the family, who owned the ’40 Ford, was planning an estate sale to liquidate the assets of the man who built the 1932 Franken-Buick. The family wanted to quickly clear out all the buildings, including structures that housed cars that had been untouched since 1975. The ’32 Buick Model 57 caught Weber’s eye. The owners, more concerned with preparing for an estate sale, knew it was once a hot rod. They confirmed that they knew it was a 302-V8. Without batting an eye, Weber and his son-in-law, Keith Lively, were loading up a 1940 Ford and the 1932 Buick sedan with the DZ 302 engine. A second lease on life for two, great American classics! 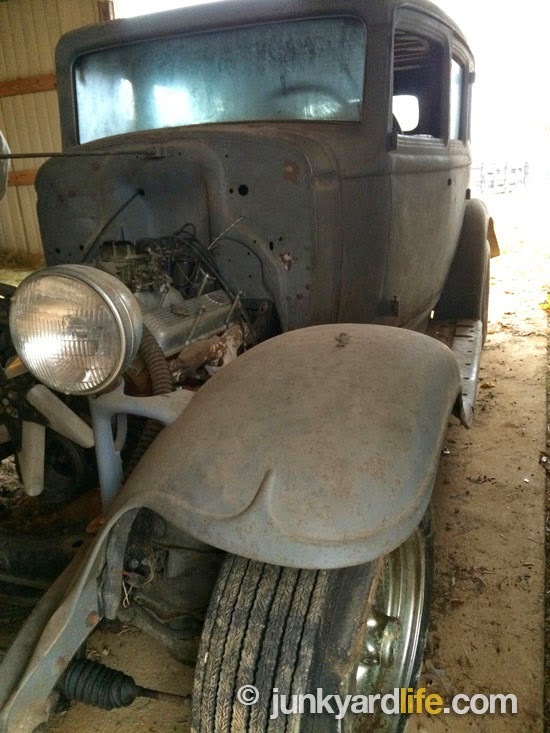 Much has changed on this 1932 Buick Model 57 except the 114-inch wheelbase. 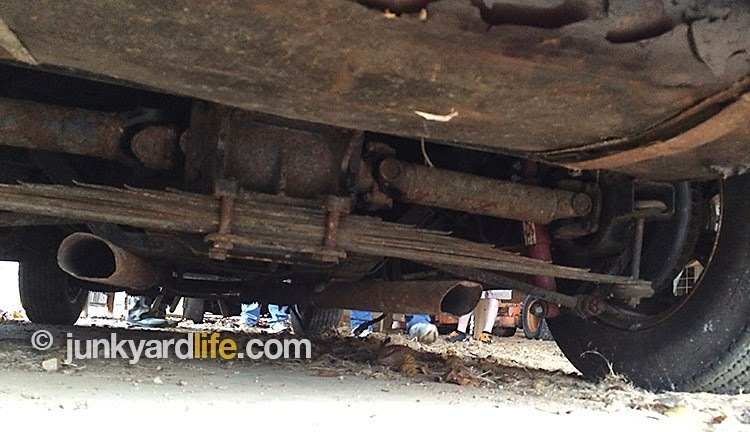 1965 Corvette independent rear suspension, disc brakes and differential casting #3830303 found under the 1932 Buick. 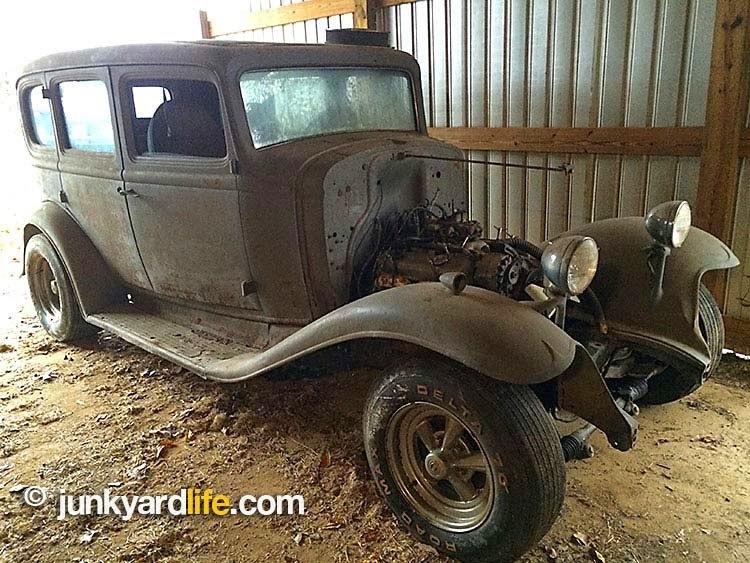 Original 1932 Buick rat rod, from 1975. Evidence that art imitates life. 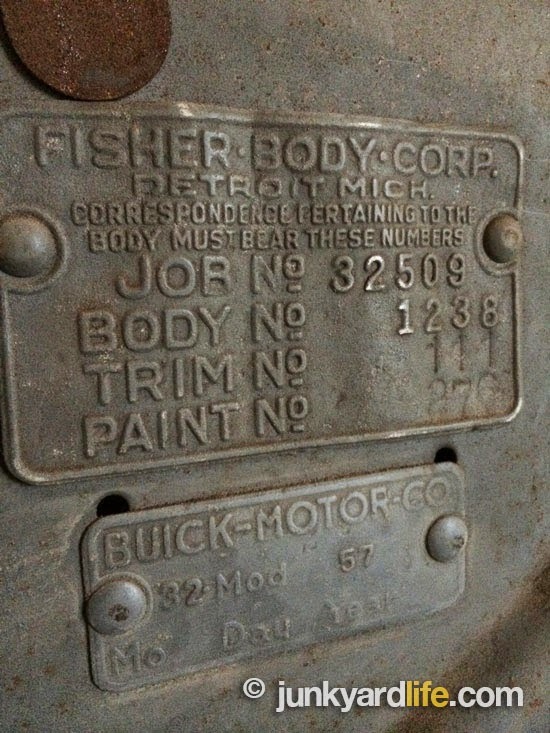 1932 Buick body tag details. 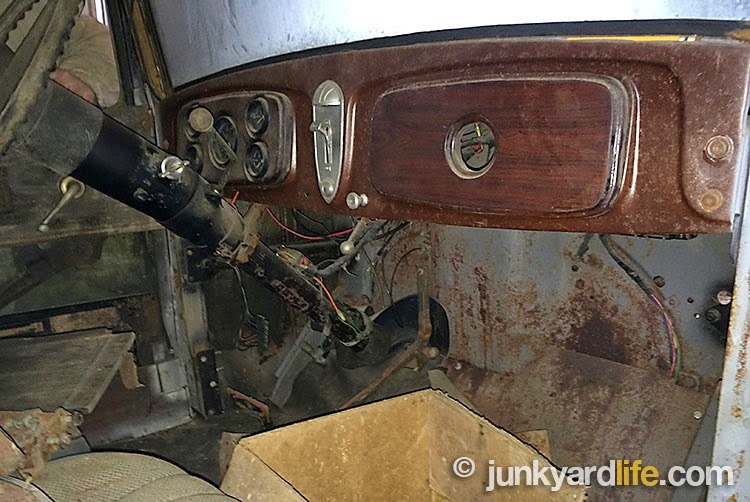 The interior of the ’32 Buick has undergone some modifications. Wood dash is original. Fisher Body construction utilized wood and steel on 1932 Buicks. Must be less that 30,000 miles on this DZ 302 engine since it was rescued from a wrecked Z28 in 1971 and parked. The engine spun over freely and looked free of gunk. 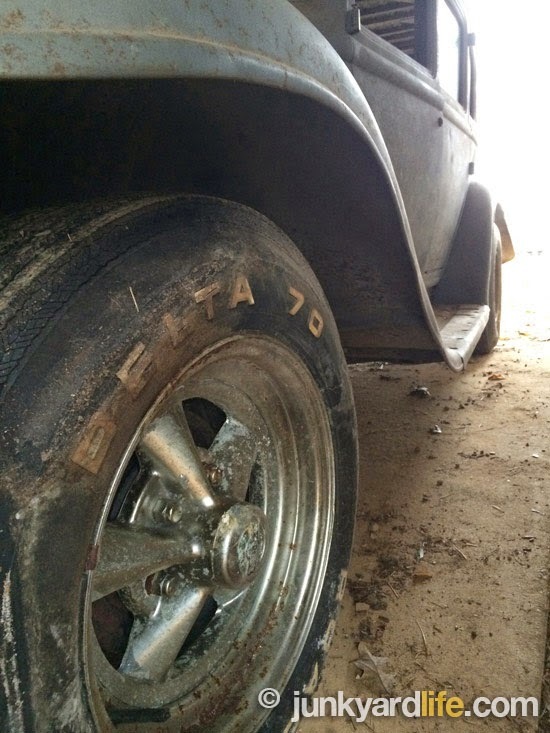 Beautiful detail on the 1932 Buick fenders — and rust-free. A Mustang II front end made its way under the 1932 Buick between 1974 and 1975. 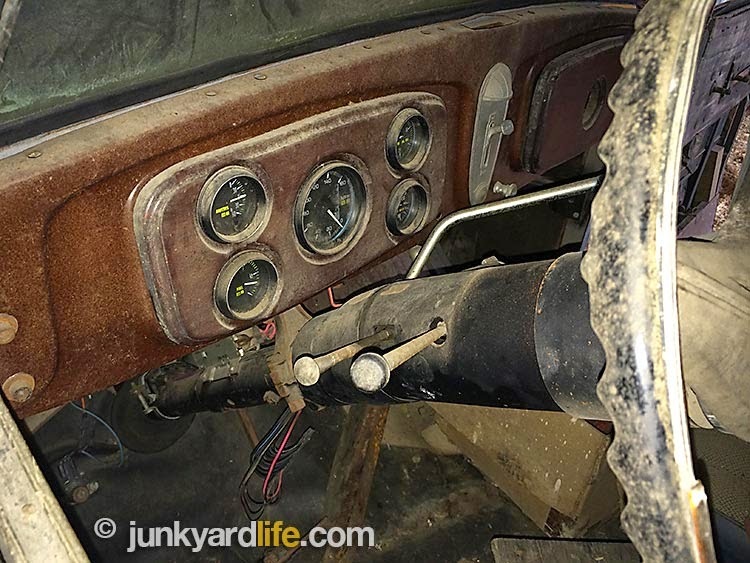 A tilt steering column and aftermarket gauges were added to the hot rod 1932 Buick. Large vents including front air scoop opens on redesigned 1932 Buick hood. DZ 302 engines featured a Winters aluminum high-rise intake with their snowflake logo. 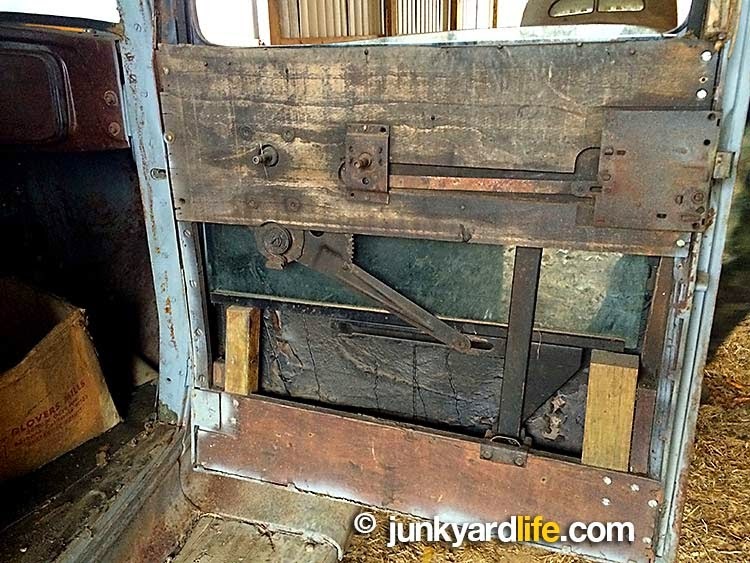 Wood panel supports center section of 1932 Buick Model 57 roof. Rocket wheels and Delta 60 tires, rear, Delta 70, front. An inline 8-cylinder powered Model 57 Buicks in 1932. That’s 230-cu. inches – a Buick favorite. 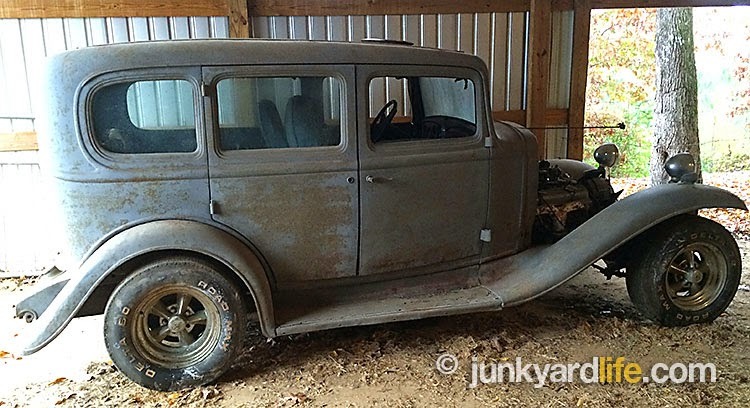 After spending decades in locked away, the 1932 Buick is moved, to you guessed it – a barn. Delta 60, raised, white letter tires spread the hot rod mojo on 5-spoke Rocket wheels. Camaro Z28 fans speak reverently of the DZ 302 engine, knowing it packs a 350-400HP punch, not the underated 290HP advertised. 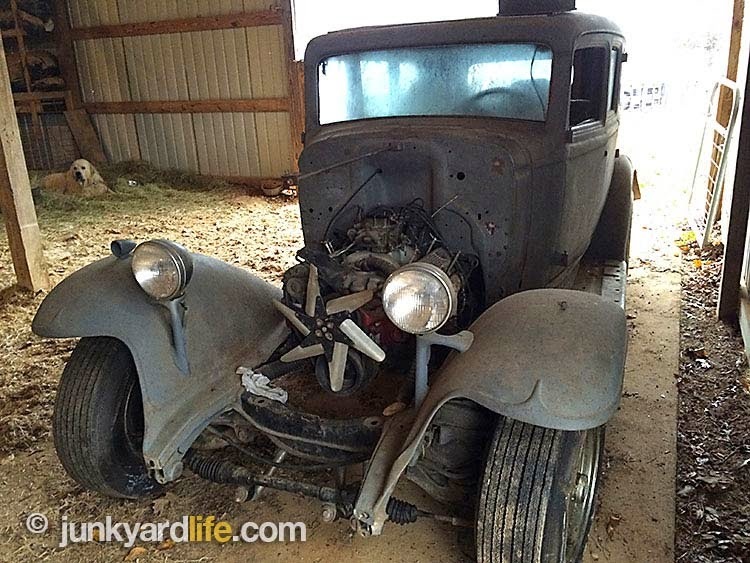 1932 Buick barn find monster or Franken-Buick lives again! Part 2: Old Car City USA tour. 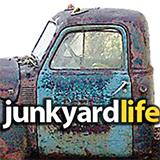 The Junkyard Life crew, consisting of, Jody Potter, Ron Kidd and Anthony Powell, continue their mission to see "The World’s Largest Junkyard," also known as Old Car City USA in White, Georgia. We had only 2 hours to cover Dean Lewis' legendary 35-acre, wooded playground of rusty relics (follow us in the video above). We found decaying carcasses of wrecked muscle cars stacked like ramshackle woodpiles. 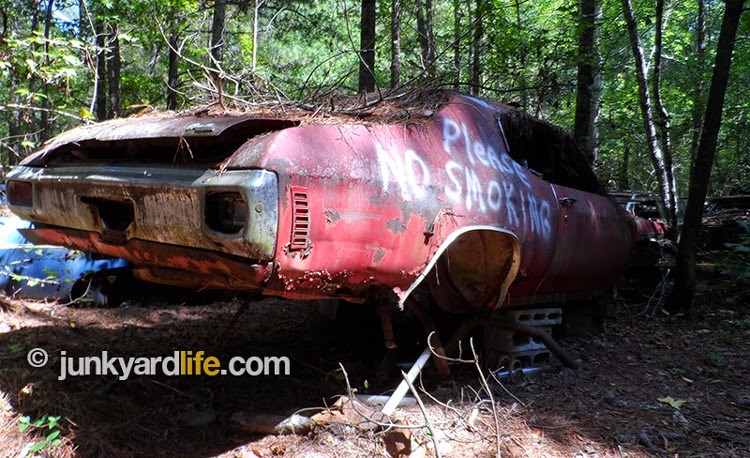 1968 Camaro SS, 1969 Mustang Mach I, 1968 Pontiac GTO, 1973 Dodge Challenger, 1969 Plymouth Road Runner, 1968 Mercury Cyclone and 1972 Pontiac Trans Am examples were just some of the derelict, dream cars discovered beneath the pines in north Georgia. It was impossible for us to see all of the 4,000-or-so, classic cars and trucks from the ’30s, ’40s, ’50s, ’60s, and ’70s along the 6-mile trail. Dean Lewis’ outdoor, automotive museum attracts customers. Dean charges $15 per person. $25 if you carry a camera. Children ages 7 to 12 are $10. Children under 6 years old get in free. Old Car City USA is a treasure trove for those who love hunting classic cars and parts. Discovering models you never knew existed or just admiring a wide variety of automotive designs at your own pace is heaven for junkyard junkies. Witnessing Old Car City in person will definitely get your junkyard dream wheels spinning. If you can’t wait to get home and find your own project car, several complete, restorable classics can be found for sale near the front office at Old Car City. Save the ones in the junkyard for future visitors. Check out the Part 2 video, above, and see if you can spot your dream car in the rough.